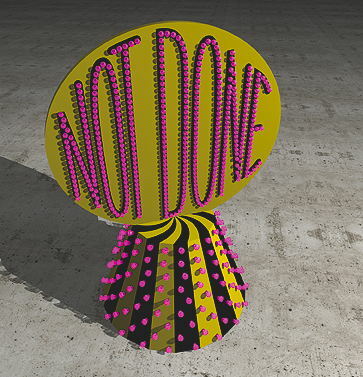 The larger-than-life sculpture NOT DONE/YET is a humorous homage to the global art scene. The pedestal, on which the sculpture stands, looks like the ones in the merry-go-rounds, with the typical colors used in US traffic signs (yellow/black). On the top, the words NOT DONE– with its counterpart YET at the backside – rotate constantly. Marcel Bühler: “The sculpture reflects, with its rhythmical flashing, silent rotation, a prototypical amusement fair – and in another lecture, the feelings of someone being ignored”. The quiet though aggressive rotation of the piece reminds the relentless presence of radar-units: surveillance over all what people do. The title of the work has several lectures: one would be the literal “not done yet” (a paradox with the physical situation of the work) but also “this hasn’t been all – The Best is Yet to Come”. Freely translated from Alexandra v. Stosch text about Marcel Bühler’s work.